The Euro weakened on Tuesday, closing at 1.1284(-19 pips) against the greenback. The greenback finished Tuesday in a relatively mixed direction, up against European and safe-haven rivals, and down against commodity-linked currency, as market players struggled again to find directional catalysts. The shared currency came under selling pressure early London amid headlines indicating that several European Central Bank policymakers think that the bank’s economic projections are too optimistic as growth weakness in China and trade tensions persist, raising doubts about growth's estimates for the second half of the year. The April ZEW survey, on the contrary, gave a first, timid sign of a possible rebound in German's economy, as economic sentiment improved in the country, rising to 3.1 from a previous -3.6, while for the Union, the index came in at 4.5 from a previous-2.5. On a down note, the survey showed that the assessment of the current situation was downbeat, down to 5.5 vs. the 8.0 expected and the previous 11.1. According to the official report, the slight improvement was largely based on the hope that the global economic environment will develop less poorly than previously assumed. Risk appetite kept the pair afloat during the first half of the day, but weighed on it in the US session, as Wall Street reached fresh yearly highs in pre-opening trading, but failed to hold on to such gains. In the US, Industrial Production contracted 0.1% in March from a month earlier, HILE the Capacity Utilization Rate eased to 78.8% in the same period, both figures missing the market's expectations. The EU will release its February Trade Balance and March inflation data this Thursday, none of them expected to rock the boat. The US will also publish its February Trade Balance, and Mortgage Applications for last week. The Cable pair weakened on Tuesday, closing at 1.3043(-55 pips) against the greenback. The UK employment report was mixed but overall upbeat, as in the three months to February, the unemployment rate remained fell to 3.9% its lowest in almost five decades, while the number of people in work in the UK hit a record high, driven by more women finding jobs. Average hourly earnings were up as expected, rising by 3.4%. However, the Claimant Count Change in March resulted worse than expected, printing 28.3K against the 20.0K expected. The positive headline was offset by not that positive comments from Labour's leader Corbyn, who said that there's no agreement yet with PM May on a customs union, environment, and worker's rights, hinting that talks are going nowhere. The UK will release March CPI and PPI figures this Wednesday, with yearly inflation seen up to 2.0% YoY. 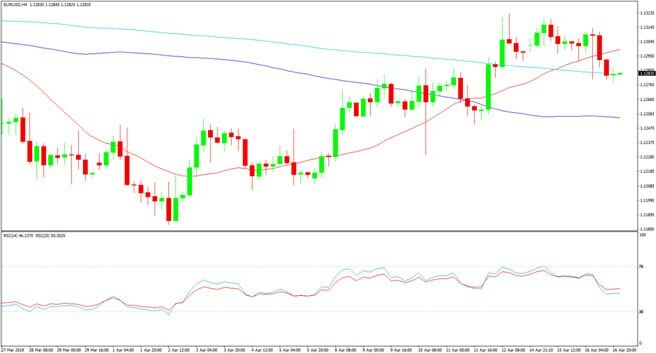 The 4 hours chart shows that the GBP/USD pair retreated further from the vicinity of a daily descendant trend line coming from the yearly high, now below the 200 EMA(Dark Blue Line) and the 20 SMA(Red Line), this last gaining downward traction. 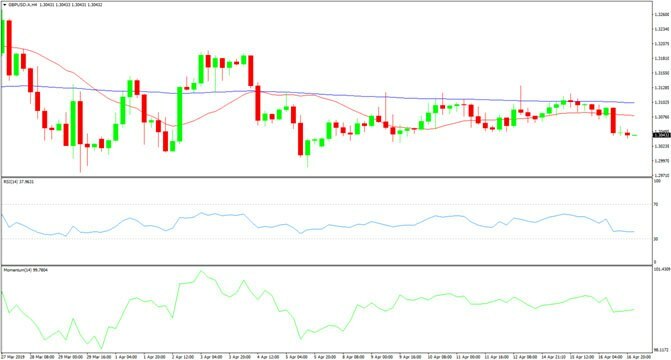 The Momentum indicator in the mentioned chart heads sharply lower within negative levels, while the RSI is partially losing its downward strength but around 40, all of which skews the risk toward the downside. The information contained in this website is of general nature only and does not take into account your objectives, financial situation or needs. Please ensure that you read the Financial Services Guide (FSG), Product Disclosure Statement (PDS), and Terms and Conditions which can be obtained on our website https://www.aetoscg.com.au, and fully understand the risks involved before deciding to acquire any of the financial products listed on this website.